Giannis Antetokounmpo scored 32 points and Khris Middleton 23 to lead the Milwaukee Bucks to a 116 to 107 win over the Golden State Warriors on Thursday night at Oracle Arena in Oakland, California. Antetokounmpo scored 30 for the sixth time this month, the 21st time on the season, to lead the Bucks to just their second victory over the Warriors in their last 10 meetings. The Warriors dropped their third straight game and seventh in 10 outings, allowing the Houston Rockets to lock up the No. 1 seed in the Western Conference but the Warriors remain firmly entrenched in the No. 2 slot in the West. 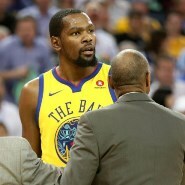 Kevin Durant, who was making his return from a rib injury, was ejected after earning two quick technicals with 2.4 seconds left in the first half of the game for arguing with the officials over no-foul calls. Khris Middleton made two free throws to cap an 11-0 run that gave Milwaukee a 58-49 halftime lead. The Warriors welcomed back Durant and Draymond Draymond Green but played again without the injured Stephen Curry (ankle sprain) and Klay Thompson (broken thumb). Durant leads the NBA with five ejections and now has 14 technical fouls, two short of the limit for a one-game suspension. Durant had 10 points, six assists, and three rebounds in 17 minutes; while Green, who missed the three previous games, had 11 points and six assists. Warriors head coach Steve Kerr said that Andre Iguodala exited the game with left knee soreness and likely won’t play on Saturday at Sacramento.